The drive to Mount Cook took us past some unusual geographical features of New Zealand. 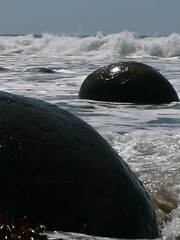 One stop was at the very strange “Moeraki boulders,” which are giant boulders washed up on the beach. They are completely out of place with anything else on the shoreline, and it is not sure what causes them to exist. Another stop was at the Elephant Rocks, where Aslan’s Camp from the Chronicles of Narnia: Lion, Witch and the Wardrobe was filmed. Sarah and I horsed about on the rocks for a while, trying to figure out which one was Aslan’s rock. We didn’t succeed, but it was fun trying. We ended up camping in Omarama, a very quiet town surrounded by mountains, with beautiful sunsets. The next day we continued up to Mt. Cook itself. We had already seen it reflected in Lake Matheson, but as it loomed over the highway in all its snow-covered glory, we truly got the best impression of the biggest mountain in Australasia. In Mt. Cook village is the Sir Edmund Hillary Centre. There is a very rugged bronze statue of him in the most famous hotel in New Zealand, the Hermitage Hotel. After having our photo taken with the most famous of mountaineers, we were inspired to do a little trekking ourselves! We headed up the “Kea trail” to a former glacier, at the base of Mt. Cook. As one of the most dangerous mountains to climb in the world, we weren’t going to tackle anything more difficult than that… but we left little rock sculptures on the side of the path, just to prove we were once there. We spent the night in our tent in Glentanner, about 25km outside of Mt. Cook Village itself. There, we were treated to a magnificent sunset over Mt. 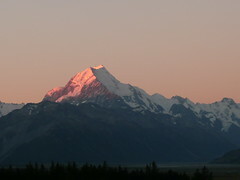 Cook, its peak blushing pink for the last hours of sunlight. Unfortunately, I was hoping to have an interesting star gazing tale to tell. 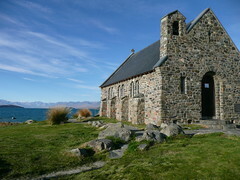 Lake Tekapo has a renowned observatory on top of a nearby mountain, and we were booked on a nighttime stargazing tour. Due to severe winds and a bright moon, our tour was cancelled… I may get another chance to try on the way back up, but Lake Tekapo is a town with very little to offer other than the tour. Waiting around for 11pm again may not be a good option.